Note: this blog posted in August 2011 it’s my favorite “super mom” story. 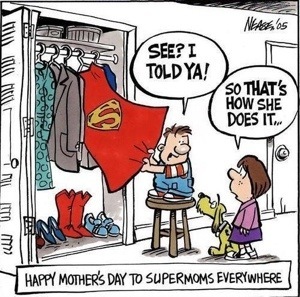 In honor of Mother’s Day I wanted to re-share and thank my TACA friends for all the hard work they do for their kids. I’m proud of you. Happy Mothers Day to you. Two tribes lived side by side. They were separated by a mountain and a valley. The two tribes deeply believed in the spirits protecting their tribes and believed they were forbidden to cross the imaginary lines separating their tribes. Because of their fear of the spirits in charge, valley tribe members never went up the mountain and mountain tribe members never walked to the valley. To violate this rule was unthinkable. One night, a valley tribe baby escaped from the safety of his tent and crawled up the mountain. The valley tribe members were distraught and frantic looking for the child. They scoured the valley for the lost child but it never occurred to them to venture up the mountain in their search. They could not cross the forbidden line. Giving up, the valley tribe members began to commiserate the loss of the child. The baby’s mother however, walked past the wailing tribe, climbed up the mountain, and recovered her child. 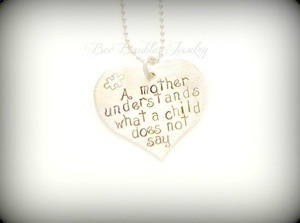 Nothing encapsulates the autism journey better than this centuries-old tale. This beautiful story describes how a family will fight every day to bring their child back. I marvel at the families that fight. I consider mine one of these families – out to do the best job we can do. My motivation for the job varies though. On some days, I want to hide under a rock and daydream about what my life would be if I waved my magic fairy wand and my child was autism-free. Luckily, most days I have the courage to storm the mountain like the valley mother in the story, and recover my child from the challenges of that day. Today I am fighting not only to bring Jeff back to the tribe. I am fighting for your child too. TACA Talk About Curing Autism. Mother. Mom. Autism. Thank you Lisa for reminding me to never give up. Over the years you have inspired me and countless others to ‘always hold on to hope’ so today — I hope your tribe treats you like the warrior mom that you are and gives you whatever you want or need on this Mother’s Day. As I’m sure they would agree with us all — YOU deserve it! Beautiful! My fellow warrior moms are the strongest moms I know! Keep up the good fight, and thanks for all you have taught me! Thanks for fighting for all our children. You are a true Valley Girl LOL! Tears! We have to stay in the press.